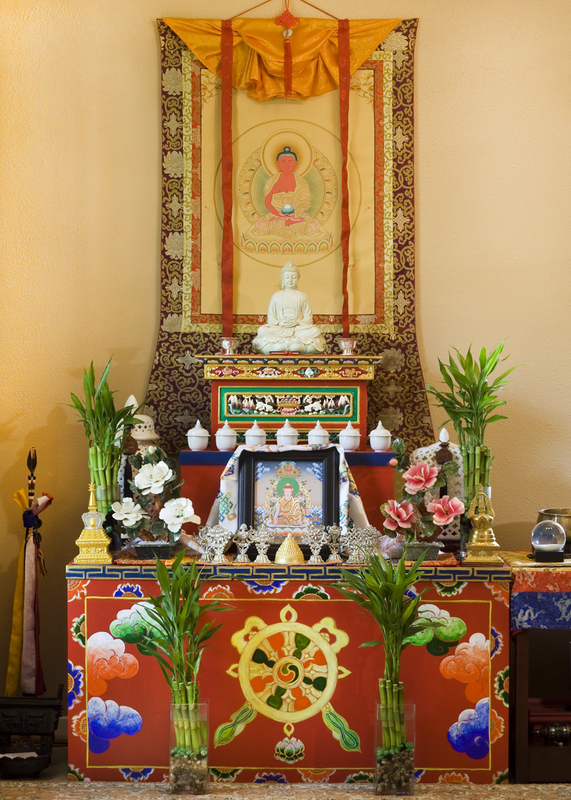 Nying Je Ling (Universal Compassion Buddhist Congregation) is a western branch of Great Middle Way Buddhism. It arose, as with all Buddhist communities, from the teachings, example, and blessings of Buddha Shakyamuni. These were then transmitted through a lineage of realized Buddhist Masters, including the Protector Maitreya, the Superior Nagarjuna, the Holy Brothers Asanga and Vasubandhu, the Omniscient Dolpopa, and the Noble Taranatha. Nying Je Ling presents the Dharma in a form that is appropriate to the needs and conditions of the contemporary world. We encourage all to follow the perfect example of simplicity and purity of practice shown by the Jonang Lamas throughout history. May the sun that illumines the Mountain Dharma of Kunchen Dolpopa’s Great Middle Way, having risen in Tibet, now shine over the West. By the merit accrued through the pure thoughts, words, and deeds of the Jonangpas, may the teachings, example, and blessings of Buddha Shakyamuni and the Buddha from Dolpo remain and flourish for the greater good and happiness of all beings. Hey would you please send me a manual of sorts on how to step by step do shentong meditation.and what i mean by send is email it to me please. The view of zhentong informs our meditation, but it is not a specific technique. Any meditation technique can be practiced with a zhentong view. It is often associated with the six-fold Vajra Yoga of the Kalachakra, but even basic breath-awarenes can be practiced from a zhentong perspective. Okay, mabey i shoild be more specific in my question.shentong difines your view of tathagatagarbha,the view of buddha nature(tathagatagarbha) is different in aspect of which view of emptiness you hold. (simply said shentong view of buddha nature my be completely different than how a rangtong views buddha nature. Sorry my phone prematureally sent. the nirvana sutra says to meditate on the true self to see the buddha nature, so can you send me a manual via email that will help me practice a meditation that will help me see my tathagatagarbha(buddha nature) based on the shentong view of buddha nature. Thank you! This new generation of Jonang Lamas will spread the definitive Dharma of the Great Middle Way throughout the world!